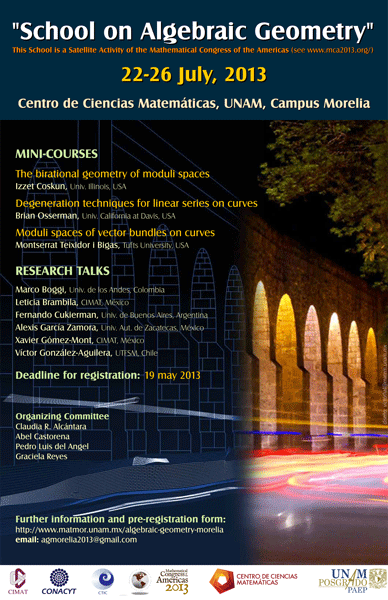 The birational geometry of moduli spaces. Degeneration techniques for linear series on curves. Moduli spaces of vector bundles on curves. We may provide some financial support for Ph.D students and Posdocs to cover only local expenses. The School will be held in UNAM Campus Morelia. Will be special transportation for all registered participants from Morelia downtown to UNAM Campus-Morelia, the distance is 10 KM, approx. We recommend to people who will pay their own accommodation book a room in Morelia downtown.